The very highest standards for refurbishments. Our shopfitting teams also provide re-fits of existing stores large and small all over the UK. 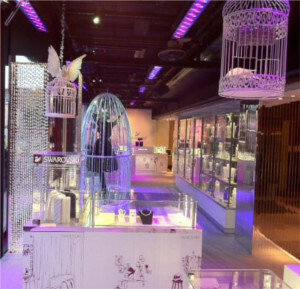 An excellent example of our refurbishment workmanship is the work we have done to change the Swarovski stores from the old red and blue store concept to the new crystal forest concept. We also construct concession stands for example in Debenhams, House of Fraser and Harrods. Christmas 2011 we installed for the first time a pop up Swarovski shop in the main 3 windows of Harrods in London. This was carried out to a very tight time schedule and was very successful. Please visit our portfolio to see many more completed projects and photos. If you would like further information on our Refurbishment services please Contact Us.